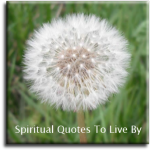 Whether it is a traditional very well known verse such as Desiderata or something new, reading spiritual inspiration poems is an easy way to make you feel good and uplift your spirit which raises your vibration and attracts more joy into your life. The poems on this page are all from known people, for more delightful verse from unknown sources please take a look at Inspirational Poems. Spiritual poems are listed alphabetically on surnames. you can handle only one at a time anyway. it's very hard to learn something new when you're talking. 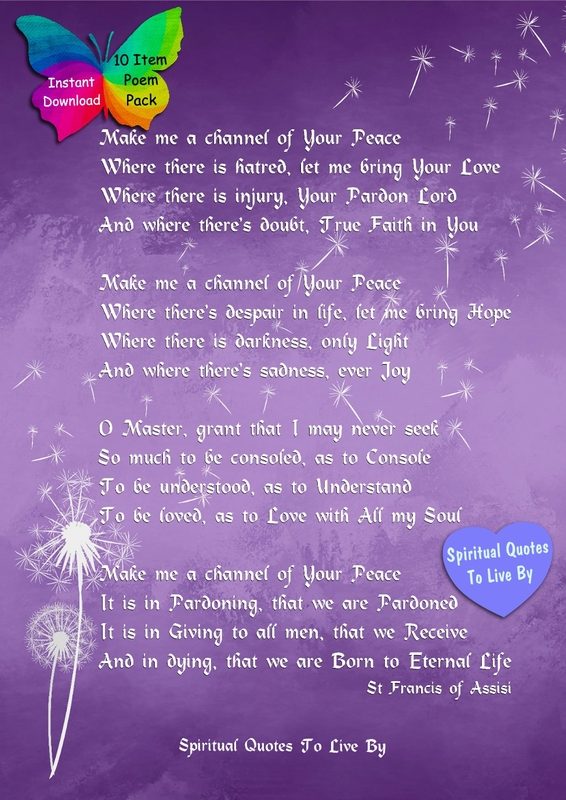 Get these beautiful words from St Francis to hang on your wall and give a print to those you wish to inspire. Send them as a card to a friend or loved one, use them as a bookmark in your latest novel, share them on social media to inspire others, carry them with you in your pocket, stick them in your diary or favourite book or give a little card to a friend. Share JPG - use on website, post on Facebook etc..
Make Me A Channel is available in both of these designs. (butterfly & heart not on prints, only share JPG has Spiritual Quotes To Live By on it) Selecting the images will take you to the individual listings or go to Spiritual Quotes To Live By on Etsy to see these and more items. The above was written in 1945, the following adapted version was released in 2000 by Lucis Trust to encompass the multi-cultural world of today. Written over 500 years ago and used by all ages as a prayer and hymn, these simple words are timeless. Selecting the image will take you to the individual listing or go to Spiritual Quotes To Live By on Etsy to see this and more items. We no longer need to fear arguments, confrontations or any kind of problems with ourselves or others. Even stars collide, and out of their crashing new worlds are born. Today, I know... That Is Life. Go placidly amid the noise and haste, and remember what peace there may be in silence. As far as possible without surrender be on good terms with all persons. Speak your truth quietly and clearly, and listen to others - even the dull and ignorant - they too have their story. By yourself. Especially, do not feign affection. Neither be cynical about love, for in the face of all aridity and disenchantment it is perennial as the grass. Due to a misunderstanding, this poem is often thought to be hundreds of years old and found inscribed in a church. Through various ways, such as a popular single that charted in the 70's, it has become one of most well-known inspirational poems. The poem is classed as being in the 'public domain' due to Max Erhmann sharing it so abundantly. Where sun hath never set? Renews each day his birth. 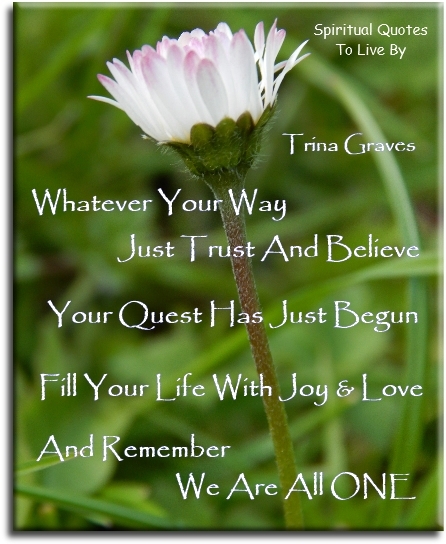 This poem uses a Wayne Dyer quote as the title and theme, but the poem is written by myself. The answers, right here and right now. Go on, put yourself to the test. If there’s truth in what you say. The world is a place of many scenes. Brings definition to your wildest dreams. And remember, we are all One. Is the hardest part for you. A calm and quiet mind. To fill the days ahead. And wipe away each tear. When doubt and fear are gone. And all the gifts You give. I believe that the best way to prepare for a future life is to be kind, live one day at a time and do the work you can do best, doing it as well as you can. I believe in my own Divinity - and yours. I believe that we are all sons of God and that it doth not yet appear what we shall be. I believe that the only way we can reach the Kingdom of Heaven is to have the Kingdom of Heaven in our hearts. I believe in sunshine, fresh air, friendship, calm sleep, beautiful thoughts - because it is what we think and do that makes us what we are. Can alter who we are. We see a different view. and to press on to the greater achievements of the future. and give a smile to every living creature that you meet. not in loud word but in great deeds. Love for all! And can it be? Can I hope it is for me? Strayed so far, and fell so low! In forbidden ways to roam! To my Father can I go? There is love for me - even me! and I need your strength and your wisdom. and my ears sharp to hear your words and your voice. under every rock and leaf. my Spirit can come to you without shame. Now you will feel no rain for each of you will be shelter to the other. Now you will feel no cold for each of you will be warmth to the other. Now there is no more loneliness for each of you will be companion to the other. Now you are two persons, but there is only one life before you. May beauty surround you both in your journey ahead and through the years. May happiness be your companions to the place where the river meets the sun. And may your days be good and long upon the Earth. Treat yourself and each other with respect. And remind yourselves often of what brought you together. Give the highest priority to the tenderness, gentleness and kindness that your connection deserves. When frustration, difficulty and fear assail your relationship, as they threaten all relationships at one time or another, remember to focus on what is right between you, not only on the part that seems wrong. In this way you can ride out the storms when clouds hide the face of the sun in your lives, remembering that even if you lose sight of it for a moment, the sun is still there. And if each of you takes responsibility for the quality of your life together, it will be marked with abundance and delight. When evening falls there you will both be. You’ll take each other’s hands and turn together to look at the road you have travelled to reach this, the hour of your happiness. It stretches behind you even as the future lies ahead. A long and winding road whose every turn means discovery. Old hopes - new laughter - shared tears. Display and share these beautiful words of love. 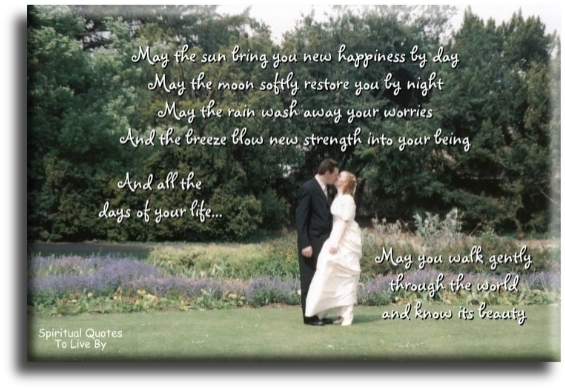 This Native American Love Blessing design is also available as just a Greetings Card with a choice of inside wording for a Wedding Day or leave blank inside for other occasions. I fall in. I am lost… I am helpless. I still takes a long time to get out. May you arise each day with a voice of blessing whispering in your heart.. I awoke so that others may Awaken. I learn so that others may also learn. I transform so that others may transform. I lighten my load so that others may change theirs. I learn to see so that others may also see. I forgave myself so that I may help others to forgive. I love myself so that I can bring out love in others. You are the books you read, the films you watch, the music you listen to, the people you meet, the dreams you have, and the conversations you engage in. You are what you take from these. You are the sound of the ocean, breath of the fresh air, the brightest light and the darkest corner. You are a collective of every experience you have had in your life. You are every single second of every day. So drown yourself in a sea of knowledge and existence. Let the words run through your veins and the colours fill your mind until there is nothing left to do but explode. There are no wrong answers, inspiration is everything. Sit back, relax and take it all in. Through a request to share my poems I have discovered BodyAndSoulNourishmentBlog, Amira has many inspirational stories - not on here - along with poems and quotes too.